So, as you know, we're working on turning the front room into a study for Mr. Magpie. He's been relegated to the garage, and winter is coming, and heating bills, etc., etc., and the poor man really should have a decent space in the house, right? Plus, you know what's funny? Whenever I have daydreamed about my "dream house" I have always imagined it as an old farmhouse with a study off the front entry hall. So that's what we're making! We don't have an entry hall, and the French doors will have to be at the entrance of the main living space rather than enclosing the study (our architecture is '50's wonky FUN! But regardless, we're moving forward, and if you've been following along on Facebook, you have seen we've done quite a bit! I'll share more about that here on the blog in the next few days. But meanwhile, let's talk paint colors. So I was trying to figure out that wall color. It's not exactly black -- it's a blue-black. I looked through my fan deck, but I just felt like I was shooting in the dark. I decided to try the Chip It! tool from Sherwin-Williams. Why not, since I usually use their paint? Which is saying... what is the wall color? Tempe Star? I don't think so. 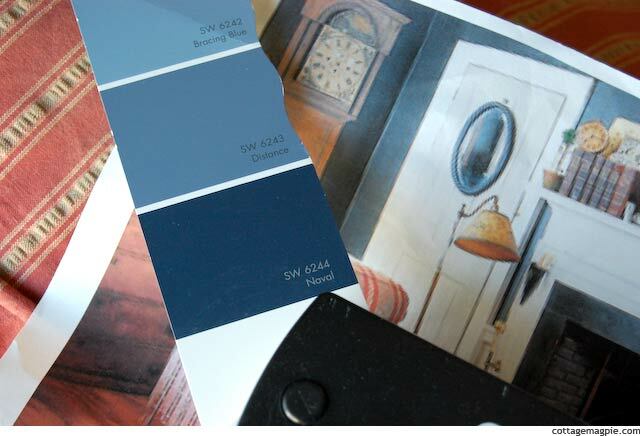 So I'm wondering how the heck I'm going to figure out which color, and not wanting to shell out for four or five samples, and then completely by random luck, Sarah from Yellow Cape Cod did a post on a client project she did using one of my paint colors, Naval (SW 6244)! It's a great room, isn't it? But the blue is definitely blue, as opposed to blue-black. But then I was, like, OH OF COURSE, I should just hunt around and find examples of the rooms painted in real life! Sure, it will look different in other people's homse (different light, etc. ), but it will at least give me an idea! Man, I love that room! We are definitely going to have that on our inspiration board when we do Rocket Boy's room next! Anyway, ultimately, though, we decided not to use Rainstorm for the room. It's still really blue, and doesn't have that blue-black thing going on like the inspiration picture. And Inkwell is really all the way to black. There is some blue in it, but only barely. I do actually think it's probably a good match to the room, but we were both thinking of it being slightly blue. We briefly considered Cyberspace (because.... cyberspace), and while I do like that one, I think I'm going to save it for something chalkboard-y and stick to a blue-black for this one. Cyberspace (SW 7076) is really, truly grey. For the feel we're going for, I think it just might be perfect. Tune in tomorrow for an update on the progress, and exactly where we are on the "to do" list! NOTE: This is NOT a sponsored post, I just thought the Chip It! tool might work for me, and I genuinely love Sherwin-Williams.